With this philosophy as our main criteria of how we define and perceive Art, much of what we do in our everyday lives could quite possibly, be seen as a form of artistic expression. And if we began viewing these common things in such a light, then in so doing, we are are led towards living each day…… artistically. Yesterday’s adventures included a work related excursion first, to the UWA campus Sunken Gardens in the morning. Later on in the afternoon, a visit to Queen’s Garden was fun. While in the Sunken Gardens, the small group and I sat under the shaded canopy of a large flourishing, grove of trees. It was, Lovely. The concepts presented to the group had three major points. Moving towards peace and harmony with the surroundings and self. The patient, listening and sensing the specific ‘mood’ of the space/place we had chosen as our subjects. As we progressively lose these fears, finding more peace and harmony – we are in essence doing what Thomas Merton stated… finding ourselves and losing ourselves in the most wonderful ways. While in the gardens the thought crossed my mind about having preconceived ideas. Its so easy. I realised I was closing my mind off to the possibilities, that ALL those greens could present. I concluded that I was being … ‘judgemental’ in my own way, of what I will or will not accept. As art. And that maybe, by being more open….I could find an infinity of possibilities waiting for me that I’d never suspected, within The Greens. I should at least, try. I think, in the photo image below of the pond, I managed to capture some of the many possibilities of All Those Greens. I lose myself, and find myself…Within The Greens. Art has thousands of variations, nuances. As individuals we each have our own particular preferences. One person’s preferring vanilla ice cream over strawberry ice cream doesn’t nullify that the vanilla is still … ice cream. Isn’t it odd how we never think to debate about someone else’s different food preferences? Art may be rock n roll to some, opera to another. Some may view Andy Warhol as THE Definition of Art; another rave Rembrant. It is all art, in every one of the myriad forms it takes. Cooking, music, writing, video, screenwriting, hospitality, textiles…. And, we actually require the seemingly, chaotic diversity of each and every one of these forms. It stretches us. We grow. We learn. 2019 I’m conducting a year long course with the title “Watercolor, Loose and Easy.” It sounds like A Plain, Ordinary, Watercolor class. However, I’m enthusiastically passing along information on 3D, sculpture, and any other art form that presents itself, as an opportunity for the group to expand their knowledge base. 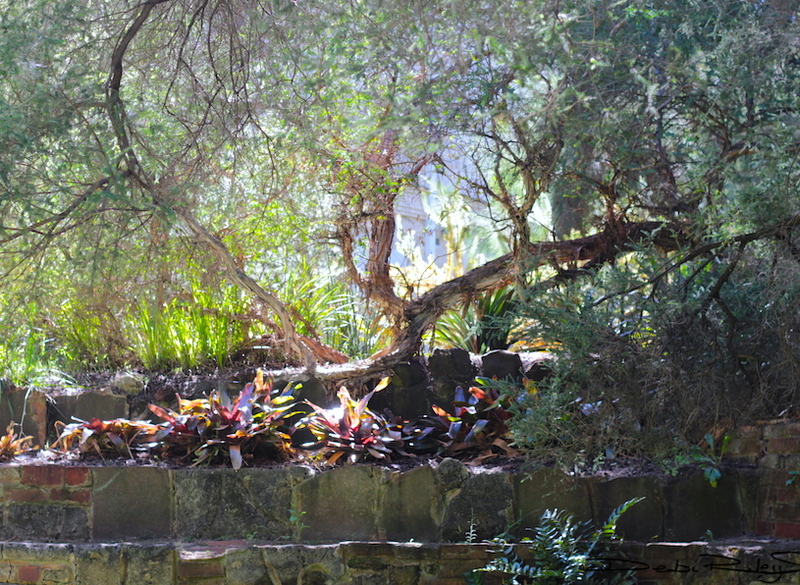 UWA Sunken Gardens, Perth W.A. This month has been busy. Leading excursions to galleries and venues with various art forms: video, sculpture, ceramics. The last week’s course home project…. was the creation of a 3d sculpture, in yellow. The course title, is Watercolor. Loose and Easy. Yet, I strongly feel that now is the time for us to try on a new pair of glasses. It’s time. We need to expand our world. Is it an online course Debi? Very soothing and peaceful scenes. It sure was. I could easily have my walls papered with those photos. I used to have a ‘discussion’ very similar to this with one of my art teachers from many years ago. She strongly believed that art was ‘art’ only if it had value–usually monetary–to an outside audience. I disagreed–art is definitely more a exercise of spirit and experience, as you’ve explored so beautifully here! Sorry I missed the day. Sounds beautiful. Thank you Debi for your inspiration, enthusiasm and sharing the magic of art. we did miss you! but, the IG and www posts help 🙂 cheers, Debi. Your posts always soothe and inspire. The photo of “within the greens” really inspired me. We’re supposed to do an abstract in a class I’m taking tomorrow, and I may use that as a prompt. Hi Sherry, thank you😊 I have drastically cut back time spent on posts and on all devices, focusing more on my own art. But I still feel strongly about sharing too!